Are you really getting the results you want from your marketing efforts? Do you feel disappointed by the lack of visitors and engagement on your social media and website? Maybe you see other people getting the engagement you would LOVE! The answer to all these problems is – LET ME HELP YOU. How would you feel if you knew exactly what to post EVERY day throughout 2019 to promote your Pet Business? I can guarantee you would feel happy, organised and confident in your marketing efforts – because I know I do! 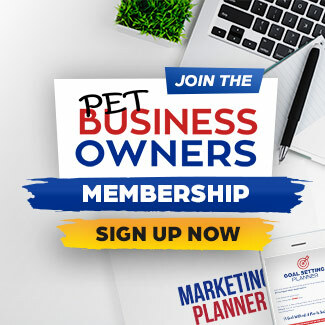 The 2019 Pet Biz Marketing Planner is Updated, More Detailed and Tried and Tested by ME in my Pet Business! Having the Marketing Planner in 2019 will be like having me right beside you so you never feel lost or confused again about what to post. What Is The Pet Biz Marketing Planner? An actionable marketing plan that you can use to grow your business. During 2018 I have spent hours finding out what works and what doesn’t and tweaking things to get the best results for my business. I love creating content and by having a really clear plan I have been able to capitalise on every content opportunity in 2018 to make sure my business is at the forefront of everyone’s mind when they are thinking about Pet Care. I don’t want you to have to stress about what to post and when. I want you to take advantage of this amazing marketing plan and take control of your marketing in 2019. And I’m a Speaker at events! What Do Other People Think Of The Marketing Plan? What’s In the Pet Biz Marketing Planner? Each month you will have your social media posts for you ready to post onto Facebook, Twitter or Instagram. You will know exactly what to post to make the most of pet days of the year, seasonal days and holidays. You will also get examples of how to engage with your followers so you can turn them into customers. Each month you will have an outline of what to post in your group each week to grow your group and turn members into life-long fans and customers. And you will get the exact Facebook Post that I use to promote my group and attract a consistent stream of new members. A month by month plan of what content to create for blogs, videos or podcasts. I will also include my checklist to promote your content so that more people see your posts. PLUS my blog template outline so you can write blogs that are more effective and quicker to write than ever. Never be stuck for what to send out to your mailing list with my email marketing template. Just add your own information in each week and send it to your list. A simple, but very effective, way to stay in touch with your list. I’ll also add reminders to your marketing plan to send your newsletter and prompts to keep promoting people to sign up to your list throughout the year. Monthly promotions and competition ideas so that you can build your following, and engage your audience, WITHOUT constantly giving away free things. A short video, each month, showing you how to implement your marketing plan for that month. A video tutorial showing you the 2 resources I use to create social media images in seconds. This is where the real magic happens! You can attend my fortnightly ‘Coffee with Kate’ Group coaching sessions to ask questions, get feedback and connect with other Pet Business Owners. These are free online sessions where we meet in an online meeting room and you can ask me about anything during the hour. Get help with your social media, show me a blog post, get feedback on a marketing idea…ANYTHING! Plus access to my Private Facebook Group to ask questions anytime of the day! Don’t Have Time To Post Your Updates? No problem, you can nominate one member from your team to get access to the Coffee with Kate and the Facebook Group so that they can utilise the resources on your behalf. Who Is the Pet Biz Marketing Planner For? Ambitious Pet Business owners who want to take control of their marketing and ensure a steady flow of enquiries all year round. Those people who want guidance and ideas of what to do – but want to engage with their audience themselves and put their own creative flare into their marketing. Who Is the Pet Biz Marketing Planner NOT For? People who want someone to post their marketing updates for them or manage their social media. What you are getting here is a done for you plan which you, or one of your team members, need to implement with my help. Are You Ready To Plan the Perfect 2019? Sign up for your 2019 Marketing Planner and be ahead of the competition all year round. Please Note: The Planner will be available from the 1st Nov and you will get a notification that it is available to download in the Pet Business Owners School Training Centre. At the end of November I will be doing an online Plan With Me Session to help you use the planner, answer any questions and get set up for success in 2019. This will be recorded and made available to those who can’t attend live. How will the planner be delivered? You will get access to the Pet Biz Marketing Planner via the Pet Business Owners Training School on the 1st Nov.
Will this work for me if I am a Dog Trainer, Groomer, Vet? Yes, the planner is suitable for all pet related businesses. That’s not a service I offer and with the planner you will be able to do this yourself easily each day. Plus you can always attend Coffee With Kate to ask me question anytime. How much time will I need to spend on this each week? The planner will give you suggestions of things to do and you can decide how much you can commit to doing. Consistency is key – so I recommend starting with smaller amounts and building up your activity over time. I can just look up all this information online for free – why would I pay for it? You can look it up online and if you have time to do that then that’s great. What you are purchasing with the planner is a done for you marketing plan for 2019. Is the planner for cat and dog businesses? Yes, the content will be 50/50 cats and dogs – but a lot of the items you can use for cats and dogs. For example, most blog titles or Social media posts will be suitable to ask cat for dog owners. What does Coffee With Kate include? This is my free online coaching that I host every fortnight for 1 hour. We meet online and you can ask any questions you want to about marketing your business. It’s a great opportunity to pick my brain, run ideas by me and make yourself accountable to your marketing plan. What will the Facebook Group include? The Facebook group is a place for you to ask questions, share ideas, learn about new ideas for blogs etc. It’s a community for people who WANT to market their Pet Business in 2019. Don’t Delay – grab your copy now!